Its long past due that I wrap up what i like to call my "Silver Nail Series". Really, I just did 3 nails out of the same silver glitter gel, and this is the 3rd and final nail that I did... cause seriously, who could ever be done with the silver? Not me, for certain! Anyway, this last nail was a sculptured gel nail. 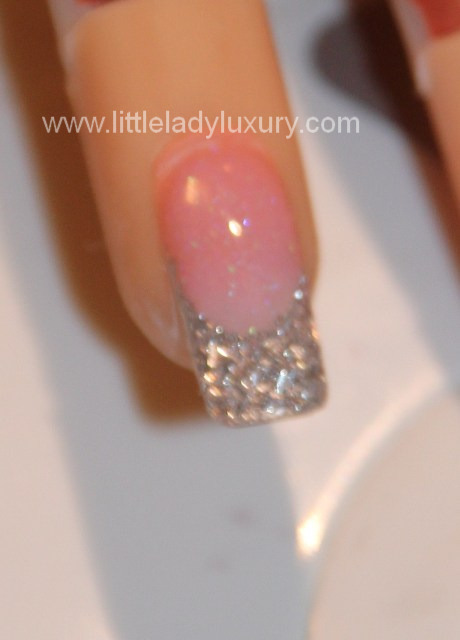 It was done by sculpting the pink nailbed from LE cover pink with glitter mixed in and then by adding the silver gel tip in LE's "Icicles" and topped with a clear gel. I was pretty happy with how this one turned out - definitely something i'd wear on myself if i could sculpt smile lines with my left hand *sigh* but I'm not quite that good... yet :) Anyway, the first two pictures are close-ups of the silver nail, followed by a few pictures recapping all 3 nails that I did. As for me, I'm still out to sea near Antarctica, and this will probably be my last post until I get back to land... this took FOREVER to load. With me being on days, and our internet being what it is, its just too hard to find time when the internet wants to work. Picture your old dial-up days... but worse! Anyway, until next time... which is hopefully soon!